Folding A Pretty Future: An Interview with Foldyard & Co. In a world that is steadily going digital, every tangible piece of art that comes our way deserves our hands-on celebration. And in the case of paper diorama artists FoldYard & Co., this praise comes effortless… especially since the most sophisticated thing some of us here at Bookbed can do with paper has to involve fancy scissors! Erwin Hilao and Elyoo dela Cruz do a lot of paper cutting and folding, with their art landing them in publications such as L’Officiel Manila, Preview and Rogue. 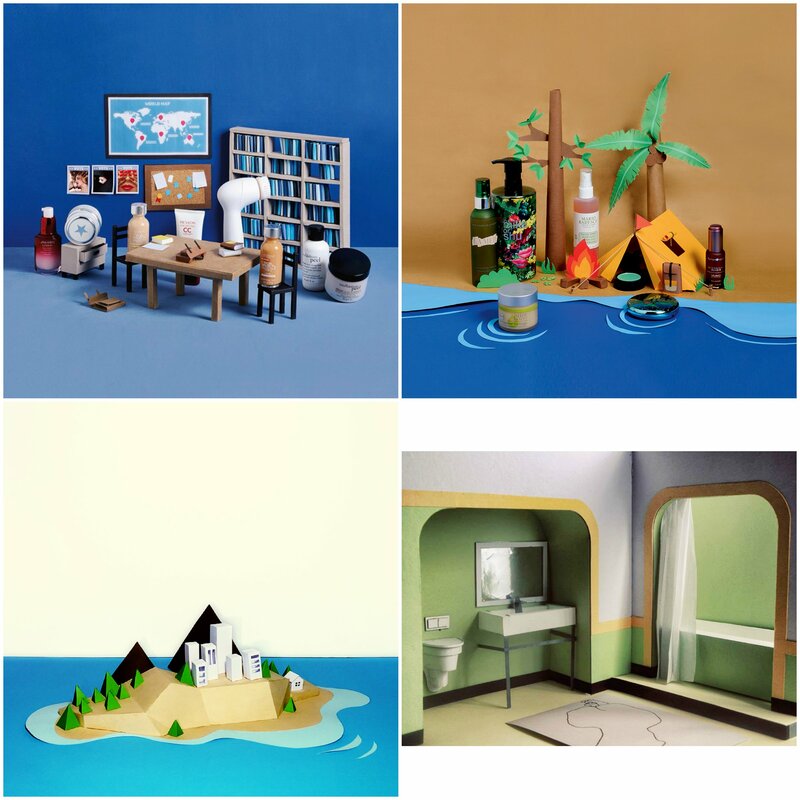 Carrying a tradition whose roots can be traced back to the late 19th century, the couple has worked on a couple of campaigns from fashion to music that recreate 2D or 3D miniature models of things that make us squeal with glee (and remind us we can’t use scissors that well). FoldYard & Co. is made up of Elyoo and Erwin, both freelance graphic designers/illustrators based in Manila, Philippines. Email them at foldyardandco@gmail.com or like them on Facebook at FoldYard & Co.
Hi, Elyoo and Erwin! What inspired you to start FoldYard? Elyoo:Our friends hold a monthly band production (Attraction! Reaction!) and Erwin thought it would be a nice project and volunteered us to make a poster for their February 2013 show. We thought of playing around with different materials such as paper or clay, just to deviate from what we normally do with our line of work. Those look fantastic! But why is paper your material of choice? Or, like you said in your interview with Scout Magazine, why the need to create something tangible as opposed to digital? Both of us are graphic designers/illustrators by profession, and we do everything mostly digitally. When we were kids, we got fascinated with paper folding. Rather than making something using our computers, we decided to try manual cutting and folding. I guess we just wanted to get that feel of manual labor. Let’s talk about that manual labor… So how do you usually approach a project? Is there a strict division of tasks between you two, or is it more flexible? Elyoo: We usually think about how to construct an item first, such as if it’s possible to do it in 3D or just 2D. The tasks are mostly divided, but I usually take care of figuring out the patterns while Erwin works on free-hand cutting and styling. With the amount of multimedia collaborations today, do you have plans of incorporating more materials into your creations, or do you plan to stick with paper? We plan to stick with paper for now, but we are definitely open to using other materials in the future. Speaking of a pretty future, what’s the paper diorama dream? What kind of concept do you dream of creating? Erwin: Maybe my own miniature paper city. I have so much things I want to recreate. Like maybe a scene from a movie or a video game. Elyoo: Wes Anderson sets! 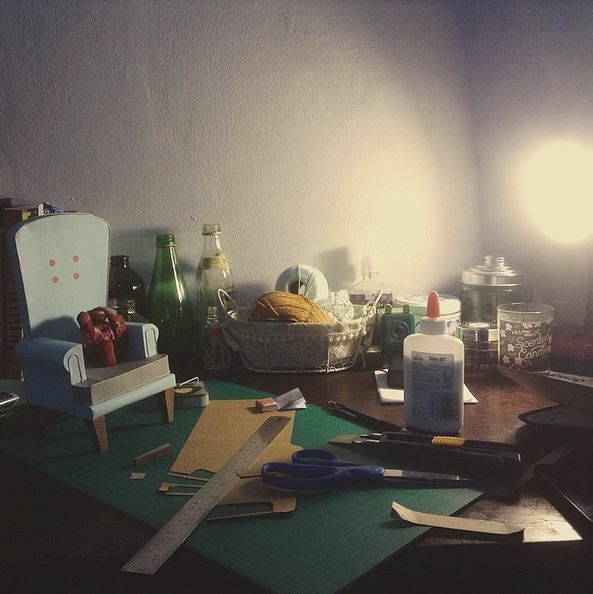 I’ve been dreaming of making a paper diorama of The Grand Budapest Hotel. Thoughts on how your work can contribute to Philippine art? We’re not sure how it can help the country artistically but I guess we, together with most of the local artists/friends, are supporting each other to get our voices out there. There’s a lot of great creatives here in the Philippines, and who knows? Someday we get to be recognized as one of the premiere art and culture spots in the world. Erwin: Letters to a Young Poet by Rainer Maria Rilke is on the top of my list. Lately, I’ve been mostly reading comic books/graphic novels, and a few of my old/new favorites are Gabriel Ma and Fabio Moon’s Daytripper, Jeffrey Brown’s Clumsy, Brian Vaughan/Fiona Staples Saga and Jeff Lemire’s Underwater Welder. I also just restarted Indecision by Benjamin Kunkel (which I should’ve finished years ago). Elyoo: I have a lot of favorite books but these are the ones that I could think of at the moment: Harry Potter series, The Lord of the Rings trilogy, The Blind Assassin by Margaret Atwood, Jonathan Strange and Mr. Norrell by Susanna Clarke, Emma by Jane Austen, American Gods by Neil Gaiman and The Bell Jar by Sylvia Plath. I can go into lengths on why they are my favorite, but common reason amongst all of them is that I enjoyed them thoroughly.